Lock in a great price for Hotel-Restaurant Kriva Ćuprija - rated 9.4 by recent guests. Close to everything. Staff more then helpful. Restaurant food was very nice. The staff were exceptional. I was really rushing and I had only 15 minutes to make an important teleconference (I know... I know... I was meant to be on holiday but this was the last work thing really needed to attend to and then I was free). Anyway they handled me rushing in and cutting the check in short and saying : "I need to set up now." They just handled it really really well. Later we chatted to them at length and they were both just delightful. The room was fantastic with an amazing location and amazing outlook. The steak we had in the restaurant was the best we had had in a long while. Really top notch all around. Breakfast was great. I just really really liked this place. Best Hotel experience we have had in a long while! Staff went above expectations in serving us. They were more than helpful and helped us in everything. Thanks for Amina most to help and guide us. This place was actually better then I was expecting. There was nothing I could complain about. The staff were super friendly, location is as good as you can get. Breakfast was excellent, I truly enjoyed it. The staff was nice and took my luggage up the flights of stairs, which was great. I got a mini intro session on the facilities, food and Mostar itself which was a bit over the top for me, but I am guessing first time visitors would appreciate it. There was some juice and fruits with it, so that was great - I needed the refreshment. A beautiful building in a great location with super attentive and friendly staff. Highly recommended. Folks working at the hotel: Adrian, the two sweet recepcionists, the manager. Its location. Location in the old town is absolutely perfect, room was great and food in the restaurant fantastic. But what really makes this place is the effort that everyone on the staff puts into making sure you are happy and have everything you need. They really do everything to make sure you're having a perfect time. One of our top picks in Mostar.Set in heritage-listed limestone house, Hotel-Restaurant Kriva Ćuprija is situated just steps away from the UNESCO-protected Old Bridge in Mostar. It offers rooms with balconies, a restaurant serving traditional dishes and a summer terrace overlooking the Radobolja River. Free WiFi is provided. All rooms at Hotel-Restaurant Kriva Ćuprija are equipped with air conditioning, minibar and cable TV. They all have bathrooms with hairdryer, minibars and views of Mostar’s Old Town. The restaurant serves international cuisine and national dishes such as veal, saslik and freshwater fish. The dessert menu includes crepes, hurmasice, baklava and tufahija, typical Bosnian desserts. This is our guests' favourite part of Mostar, according to independent reviews. This property also has one of the best-rated locations in Mostar! Guests are happier about it compared to other properties in the area. Hotel-Restaurant Kriva Ćuprija has been welcoming Booking.com guests since 21 Dec 2007. When would you like to stay at Hotel-Restaurant Kriva Ćuprija? Air-conditioned room featuring a TV, a minibar and a safe. Private bathroom features a bath or shower and a hairdryer. 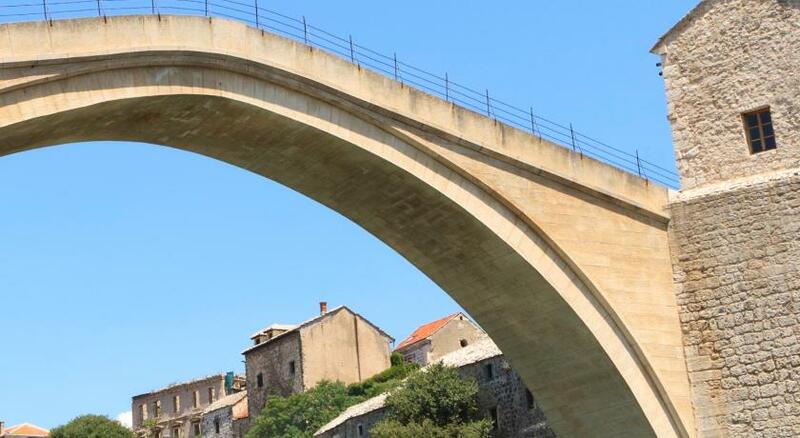 Mostar’s beautiful old bridge, Stari Most, is the star of its picturesque old town. Terracotta roofs and the minaret of the Mehmed Paša Mosque overlook the banks of the pretty Neretva River. House rules Hotel-Restaurant Kriva Ćuprija takes special requests - add in the next step! All children under 2 years are charged EUR 12 per night for children's cots/cribs. All further older children or adults are charged EUR 27 per night for extra beds. Hotel-Restaurant Kriva Ćuprija accepts these cards and reserves the right to temporarily hold an amount prior to arrival. 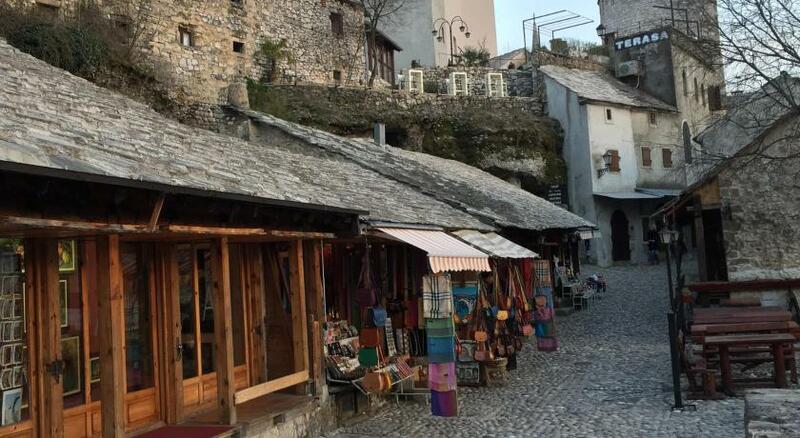 One of the most picturesque neighbourhoods in Mostar! The staff were lovely and very helpful. I arrived 3 hours before check in and they quickly found me a room I could get into immediately. Good value and great location. This is quite simply everything you could wish for from an hotel, first class service where your custom is both wanted and appreciated , immaculately clean comfortable and well presented rooms, an absolutely stunning view and location and staff who do seem genuinely happy to help. There are many larger corporate hotels that could learn a lot from the management and team sprit from this hotel. We parked some walk away as we were first time visitors. A young man from the hotel walked us back to the car, as it started to rain he called a taxi whilst we sheltered, paid for it and drove our car to the closest parking location and then proceeded to carry all our bags to the hotel. Now that is service. Our welcome to the hotel was warm and very friendly , as for our room you could not fault it. Do try the restaurant as the food is traditional and delicious, once again served with efficiency and a smile. We had a perfect stay and will be back. I have visited a lot of hotels around the whole world and this one,was one of the best hotels...I don’t know where to start. 1.The stuff was beyond friendly almost a family feeling,always around when you need them but also enough privacy 2.The room was clean and comfortable,we had the perfect view on the old bridge and a coffee in the morning on the balcony was a dream. 3.The first morning I was very tired because of my long trip and when I went to the breakfast and nice lady offered me to bring me a nice breakfast to my room so I can rest and they did not charge me for that. 4.Also the Food was PERFECT,there is everything for every taste,very fresh and the desert was traditional but beyond delicious. 5.I was on a business meeting so I had not a lot of time to walk around but when I had 2 hours I could visit everything,because it is located perfectly,the old bridge is 1/2 min. Away from it and the heart old town. I can just suggest this wonderful hotel,I went there two times and can’t wait to go again with my family,to show them this piece of art in this beautiful city,you can see and feel that this hotel and restaurant was made with a lot of love. They would not give any recommendations on anything including places to eat and things to do. It really felt like the great staff was restricted from doing so. The restaurant was expensive for what you get. Shrimp in sauce dish had about 12 shrimp the size of a penny or smaller and was considered an entree. They try to get you to buy their breakfast for 10 Euro each, DONT DO THAT. There is better food at half the price near the hotel. They have a great staff but when they can only recommend their own facilities it takes away from the experience. Beds were hard. I liked the staff and the location. Clean facilities and a great little picture gift of the bridge at the end. Staff was so nice to help with luggage and they were very happy people. Showers were great and room was nice with great views. Booked a double room which I had for all my travel bookings with booking.com.So I get hit up for an extra person. Sadly I felt scammed. Also the fact you can’t pay by card is annoying. Hmmm... The bed could have been a little firmer? I really don't have any bad things to say at all. There was nothin. Not to like about this place. Best hotel to stay in Mostar! Great staff, great hotel, great food. I enjoyed my visit. I would stay again and recommend to family and friends! We really enjoyed my stay at this hotel. The personnel was extremely kind and helpful. A lots of attention to our requests. They literally made everything they could to make our stay as comfortable and nice as possible. The breakfast buffet is the one you can have in any 4-stars hotel, good and with a wide choice: fruits, vegetables, local food, etc. The terrace has a wonderful view on the crooked bridge while eating. We also had dinner in the restaurant, we were recommended to try « sač », a local Bosnian meal made from either trout or veal and with vegetables. I tried the trout, fished in the river locally. The parking is not particularly necessary while there is free spots nearby. However, as it is registered to the UNESCO heritage, no lift can be built. Therefore, it might be tiring to climb all the stairs with a heavy luggage. However, the personnel is aware of it and offers multiple times its help to carry your luggage from your car to the room and vice-versa. We enjoyed our stay so much that we’re already thinking about coming back during the autumn! When I booked the place I asked for a double room and got a room with twin beds. I connected them into one but it would have been better if I were truly in a double bed.